Did It Replace An Older Currency? If So, What Currency Did It Replace? : Yes, it replaced the livre Dijonnais, the currency of their former colonial overlords. Did It Replace An Older Currency? If So, What Currency Did It Replace? : Yes, it replaced all the currencies in the world after the Nuclear Holocaust. Other Information: The odd denominations are in reference to the IRL Burmese notes that we used to have. Last edited by Valentine Z on Sun Jul 15, 2018 8:59 pm, edited 1 time in total. Did It Replace An Older Currency? If So, What Currency Did It Replace? : Yes, it replaced the currencies of the FL's predecessor states. Former Denominations of Currency (Coins): same as the current ones; 2 Pfennig coin abolished in 1994. Former Denominations of Currency (Banknotes): same as the current ones; 200 Mark abolished in 2001. Other Information: A 10 Pfennig coin is commonly called a Groschen; a 5 Marks coin is also known as a Heiermann. Further colloquial names are based on the currencies of the FL's predecessor states and therefore come from different languages - they vary from Krone (Scandinavian) over Zlatnik (Slavic) to Drachma (Greek), used for different denominations depending on the region. 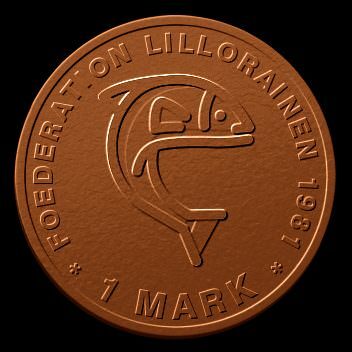 As the first series of Mark coins showed a salmon (the FL's national animal) on the back, it is also still common to call a Mark a Salmon (Lachs). Last edited by Lillorainen on Sat Jan 26, 2019 1:12 am, edited 5 times in total. Did It Replace An Older Currency? If So, What Currency Did It Replace? : The United States dollar was used in the earliest handful of years of the GA's existence. The GA is a North American country in an alternate universe set a century into the future. I use (almost all) NS stats. Check my factbook for specifics. A 9 civilization, according to this index, and a 4.7 on the Mohs Scale of Science Fiction Hardness. Current Exchange Rate with USD/NSD: Roughly $4.5o USD/NSD to TG1. Other Information: The Terran Goldmark's value is set by the Federal Bank every year, and is tied purely to the national economic situation. The value of other currencies is not regarded in setting the value of the Terran Goldmark. Last edited by Santa Maria la Barrera on Fri Nov 30, 2018 10:16 pm, edited 2 times in total. Last edited by Blustan on Thu Jul 26, 2018 2:17 pm, edited 1 time in total. Did It Replace An Older Currency? If So, What Currency Did It Replace? : The Thermadolian was created to replace the older Dæli and the newly established Æœ. Other Information: Under Thermodolian Federal law all denominations of the Thermadolian minted since April 10th 1452 are considered legal tender even if they are discontinued. Did It Replace An Older Currency? If So, What Currency Did It Replace? : The quachtli replaced the original basis of Aztec currency in which cacao beans and cloths of cotton (which were also originally called 'quachtlis') were used, in an attempt to keep up with the developing Old World. Subunits of Currency: A single quachtli is worth 100 centenens (CET). Current Exchange Rate with USD/NSD: Currently, a single quachtli is equivalent to 0.052 USD. A socialist nation set in an alternate universe in which Native American societies were mostly isolated from colonial influence. Aztlan was founded by the Aztec peoples, and has since grown into a mighty nation. Year of Adoption: 921 A.D.
Did It Replace An Older Currency? If So, What Currency Did It Replace? : Yes, local currency's used by the four kingdoms before the unification in April 921 A.D. I RP as The United Kingdoms of The Krainin Isles. Did It Replace An Older Currency? If So, What Currency Did It Replace? : The old ying was replaced due to hyperinflation in the 1970s and 1980s. Last edited by Yaina on Thu Aug 23, 2018 12:21 pm, edited 1 time in total. Από το Λονδίνο μέχρι το Κάιρο και το πρότυπο του τηλεφώνου φτάνει ψηλά! "From London to Cairo! the Standard Flies High!" Interested? Read my Minicul Approved Factbooks! A Level 5 civilization, according to this index. 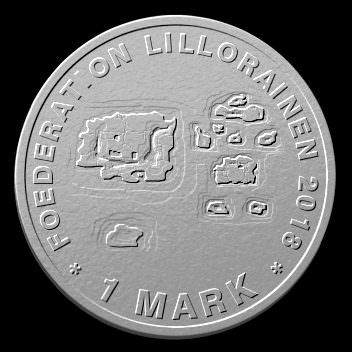 Other Information: The Fostormarke was created as a new currency after the 1989 revolution which overthrew the former socialist government. Today, the currency is very powerful and it has been adopted by nations of the Fostorian sphere, such as The Empire of the Two Suns. The currency's value is mostly based on a floating exchange system, but it is also heavily influenced by the Grand Imperial Bank. If you support capitalism, put this in your signature. Did It Replace An Older Currency? If So, What Currency Did It Replace? : No. Did It Replace An Older Currency? If So, What Currency Did It Replace? : U.S. Dollar, when we were a territory of either the U.S. or Britain, and simply trading, before we were discovered by the outside world. Other Information: In the 912th year, when AiaHoa became a kingdom, the crown was added. Last edited by AiaHoa on Tue Jul 10, 2018 3:05 am, edited 1 time in total. The Carenian Dollar replaced several currencies, most notably the US dollar, the Euro, the Pound Sterling, the Australian dollar, and the New Zealand Currency. -The symbol of the Carenian dollar is borrowed from the former USD cent symbol. -After the adoption of the Carenian dollar, the currencies of the member confederate nations remained legal tenders until 2067, and exchangeable until 2080. You do not have the authority to bump threads that are not yours. Last edited by Sufokia on Sun Jul 22, 2018 9:28 am, edited 1 time in total. Other Informations: All coins typically features the national animal of Bellcon, cat and a callalily that symbolizes beauty while on the banknotes features the nation's former leaders at the front and Bellconians historical site reverse. Last edited by Bellcon on Thu Jul 12, 2018 6:01 pm, edited 3 times in total. an Europeian nation that is known for being environmentally beautiful, ban of automobiles and interesting culture. Atlantis is an MT nation that is the third richest country in the world, behind only China and the United States. It is closer to the USA, UK, Italy and Spain (in that order, though Italy and Spain is probably tied) culturally than it is Greece. It is also a naval power. And no, Atlantis is not underwater: It has a land area around the size of France.